Here’s Tim’s weekly update for the play parks this week. It’s looking good, we can’t wait to see the giant acorn tower, but that’s under wraps for now! The Play Area for the Big Parks Project is progressing well, particularly as we’ve not had quite so much rain over the past week. The Extra High Swing is now installed and we’ve started sculpting the mounds around it. We have also installed the climbing logs in the Toddler Area’s sandpit, the timber boardwalks in situ and we’ve commenced some much needed drainage works. 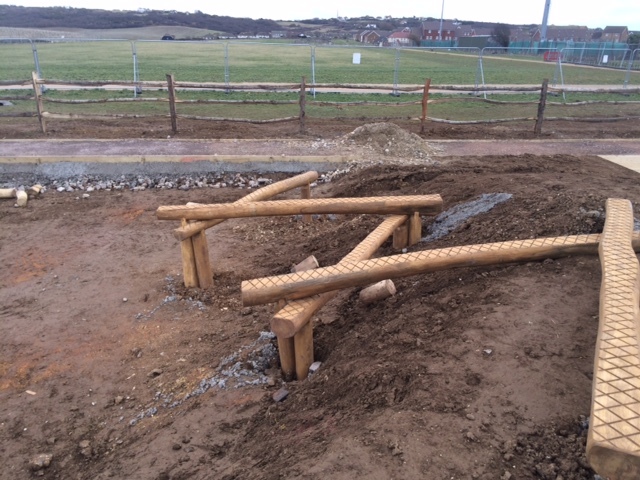 We have also prepared the pathways in the toddler area and installed the rustic chestnut post and rail fencing.